Does any flavor define autumn better than pumpkin? Okay, perhaps apple. A mug of hot apple cider, with a freshly made pumpkin donut just makes me smile! 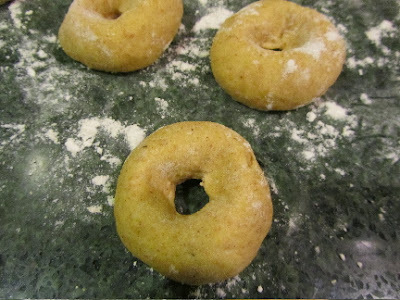 Here's my own personal recipe for pumpkin donuts. 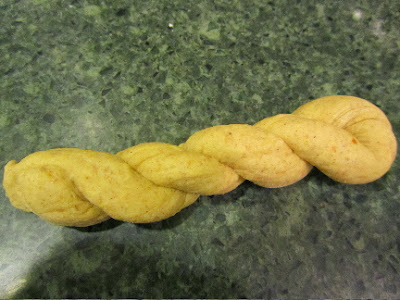 You can make them as puffs (balls), o-shaped, or twists. My favorite, with these donuts, are the pudgy little o-shaped ones. 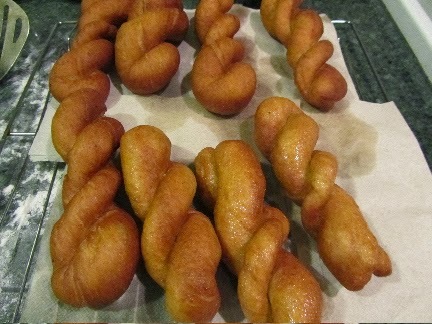 Makes 32 mini-donuts, or puffs, or 16 twists. 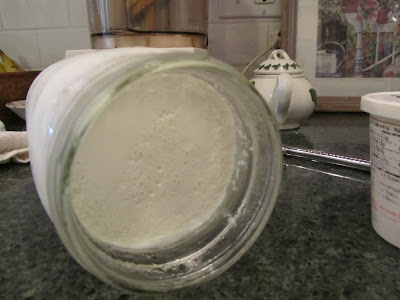 Soften yeast, in a medium bowl with warm water. In another bowl or microwaveable container, heat milk until warm, and add butter (or margarine). 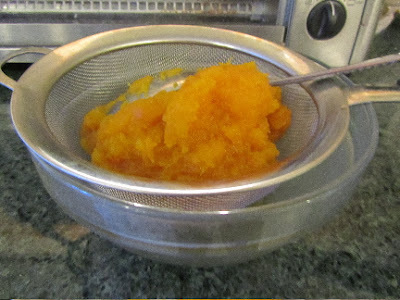 When butter is melted, stir in pumpkin puree. Allow to cool to room temp. Combine milk, butter and pumpkin mixture with softened yeast, sugar and salt. Stir in spices. Begin mixing in flour, 1 cup at a time. Add extra flour as needed for a dough that doesn't stick to your hands. Knead for 7 to 8 minutes. Place in a bowl, cover with a cloth, and allow to rise at room temp for 45 minutes to 1 hour (until doubled). Punch dough down. Divide dough into 2 portions. For each portion, if making puffs (or balls), or mini-donuts, roll on the counter to make a rope about 1 & 1/2 inches thick. Cut into 16 pieces. 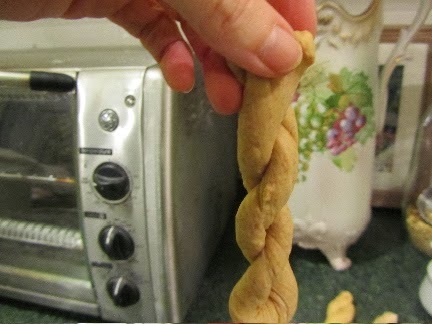 If making twists, with each portion, divide into 8 pieces. 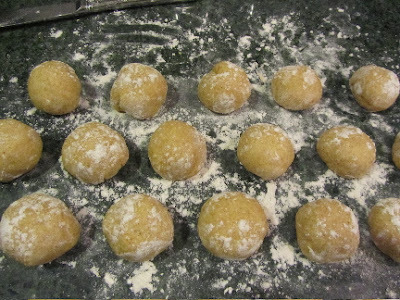 For puffs *or* mini-donuts, form each piece into a ball, by pinching the edges to the back of the ball, and set to rise on a floured surface, seam side down, about an inch or two apart, and cover with a cloth for 30-40 minutes. Repeat with other half of dough. for puffs, drop the balls of dough, a couple at a time, into oil. Only fry a couple at a time. Too many will cool your oil too quickly, and donuts will be heavy and dense. Turn as needed, cooking until browned. For mini-donuts, use your two thumbs to pull a hole into the center of each ball, stretching and pulling as needed. Only form a few at a time. Drop these mini-donuts into the hot oil, again just a couple at a time. Turn over when underside is browned, and fry until both sides are well-browned. 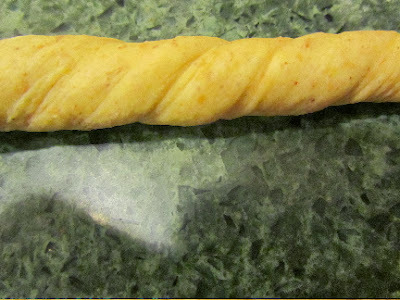 For twists, on a large floured surface (the extra space will allow you to roll and twist more easily) roll each piece into a snake about 12 inches long. Place the snake in the center of your floured surface. Now, place your right hand on the right end of the snake and left hand on the left end of the snake. Roll your right hand away from you, about 8-9 inches, simultaneously rolling your left hand towards you, about 8-9 inches. Your snake should look like it has diagonal twists all up and down the length. I cheated and added extra rolls by lifting my hands from time to time. But who cares about that. Now lift the snake up by the ends and hold them together. Your dough should begin to twist itself. Give it a little help with the twisting. 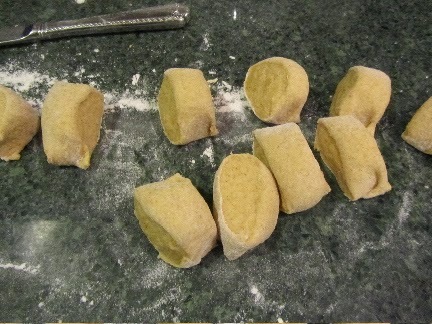 Pinch the ends together, and set on a floured surface to rise. If your first one doesn't look fab, keep at it. It gets easier with practice. Repeat with other half of dough. Once all are formed, cover and allow to rise for 30-40 minutes. Begin heating oil in last 10 minutes of rise time. When oil is hot, drop a couple of twists at a time into oil. Turn over when underside has browned. Remove from oil when twists are well-browned. Drain on paper, or paper toweling, placed on a cooling rack. Sprinkle with cinnamon-sugar, or glaze with a thin icing. These are lightly sweet, and delicious without anything extra. When I make these to go with soup or chili, I serve them plain. This dough also bakes very nicely, for occasions when I don't want all the artery-clogging, deep-frying. Increase the butter in the recipe to 3 tablespoons, for a more tender dough. For baking, after the first rise in the bowl, punch dough down, and shape for dinner rolls (crescents, Parker House, pan rolls), place on a buttered baking sheet, cover, and allow to rise for 1 hour, or until doubled in bulk. Bake at 350 degrees, for about 18-25 minutes (until browned). 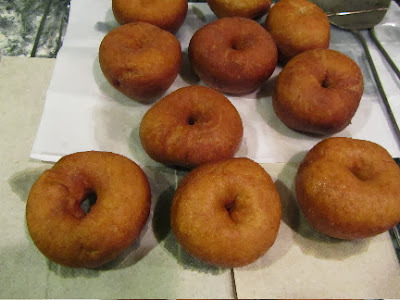 Pumpkin donuts -- one of our autumn traditions that can't be skipped! the door's open and the coffee is hot! Yay for atery clogging! A girl has got to live once in a while and these look a lot tastier than the ones the donut shops are selling here. They DO have some whole wheat flour, and pumpkin in them. So, a couple of these are practically a serving a vegetables! I'd be interested to hear what you think of sweet pumpkin treats, when you try them. I'm wondering if they're an acquired taste, or universally enjoyed. I'm all for scientific research! My recipe may not taste like DD's, but IMO, anything fresh out of the fryer is delicious! I'm glad you got the hang of the twist making. They look very professional. 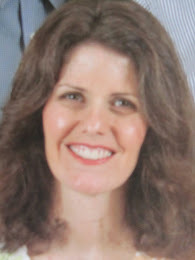 Thanks, frugal spinster! I can see why a professional would make them this way. It's much quicker, especially if making a lot of them.